Whittlers take note: Chisels, gouges, and V-tools are here to stay. While you may feel comfortable with just a knife in your hand, don’t think that these other edge tools can’t perform miracles. Remarkable as it may seem, Flexcut™ Tools offers carving tools that assume different shapes. Available in a variety of profiles, Flexcut™ Tools start out as thin strips of high carbon spring steel. 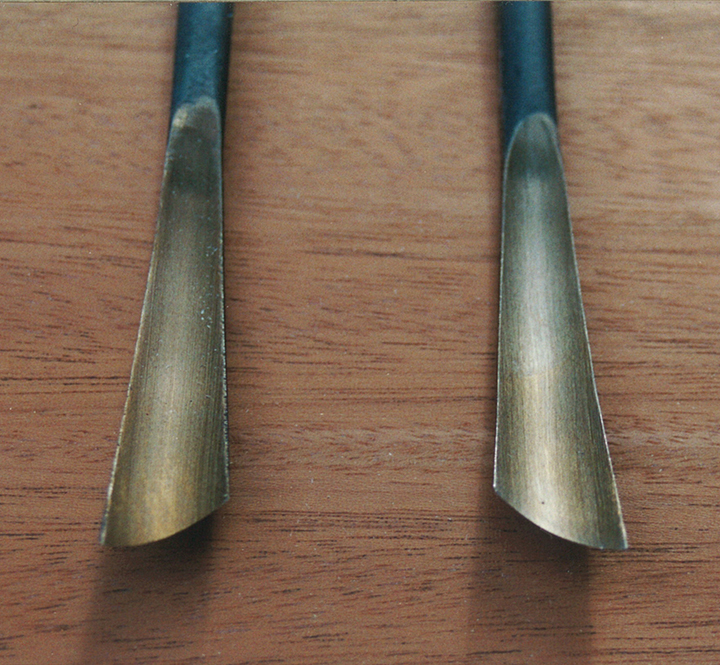 The shank is tempered for resiliency while the cutting edge is tempered to hold an edge. A dual hardness allows the tool to bend, so a gouge, for example, can handle a flat surface or flex enough to work in a recess. 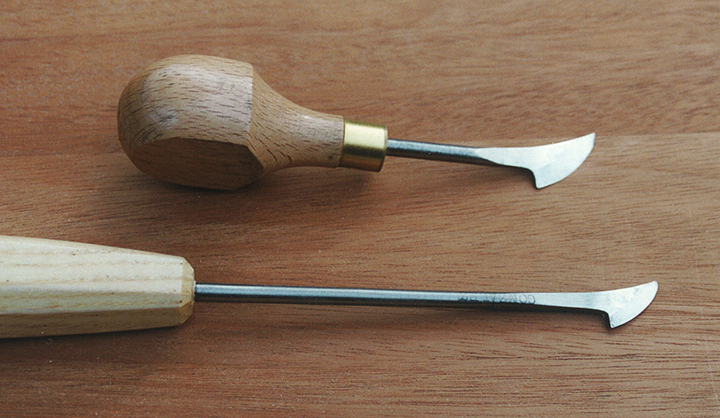 One tool performs the function of two or more carving tools. In appearance, the tools are markedly different from Ashley Isles, pfeil® Swiss Made and other brands. Each tool is oxidized to resist rust. The result is a black surface on the blade. And while most manufacturers offer the traditional round but stubby handle for their palm tools, Flexcut™’s are curved and slightly flattened. The design keeps the force of the push stroke in the heel of the palm, so you don’t need to tightly grip the handle. I find Flexcut™ Tools on many carvers’ workbenches and in their travel kits and have used them myself. In fact, when I introduced my wife to carving, I had her start with Flexcut™ palm tools. Swiss Made, Henry Taylor Tools and Flexcut™ offer skew gouges. When situations arise that have you working across the grain, or dealing with areas where the pattern overlays a lot of changes in grain direction, or when you are working in tight nooks and crannies, a skew gouge may be the one tool to do get the job done. Fred Cogelow, an American carver renowned for his realistic high-relief sculptures, designed a line of specialty tools for Henry Taylor that includes gouges both skewed and slightly bent at their ends. So that these tools can be as versatile as possible, the gouges are available in pairs: one left-handed and one right-handed. Much to their credit, Fred’s gouges offer both slicing and scooping actions. You will probably use your conventional tools a lot more often, but giving these a try will open the door to much more versatility in your detailed carvings, especially if you are working in relief or doing ornamental pieces where difficult grain is often encountered. Ray Gonzalez, a British carver, designed the hooked skew chisel for Ashley Isles. Unlike conventional skew chisels, Ray’s consists of a narrow shaft that ends in a crescent-shaped blade. The curved cutting edge decreases cutting resistance, so it can slice and pare easily. But the “hooks” will get into otherwise inaccessible corners. The cutting angle of the blade is only five degrees, a feature that produces a very fine shaving. Be advised that a caveat accompanies such a low bevel: It can break easily if used to pry wood away. Just when you feel comfortable that all possible sizes, shapes, and profiles have made it to the market, a new style of carving tool recently arrives on the scene. British woodcarver and author Chris Pye approached Ashley Isles to take a fresh approach to an old profile. The result is a very flat gouge that will leave a smoother surface than can be achieved with the traditional #3; and, almost serendipitously, it offers another useful function: rounding surfaces with utmost control. The innovative feature of the #2 1/2, not found in any other carving tool that comes from a factory, is an inner bevel. 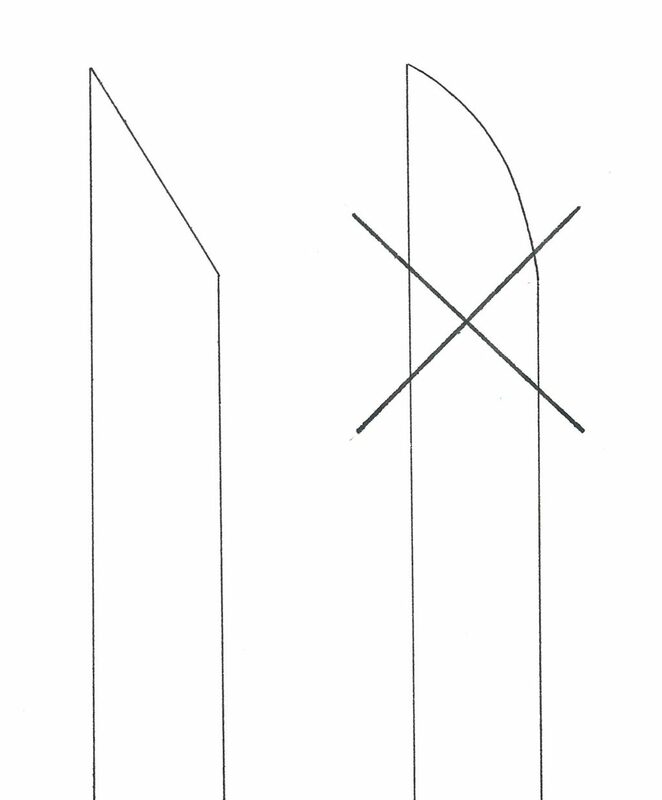 Both the inner and outer bevels are set at approximately 20°, but the inner bevel is shorter. The result is a tougher cutting edge. When the gouge is turned upside down, that inside bevel, as short as it is, keeps the cutting edge on track. Chris recommends that when using the #2 1/2 gouge across the grain, the slicing cut should start toward one corner of the cutting edge. As the blade is pushed, you drift the blade toward its middle, where the shaving is effectively lifted and then released by the time you reach the opposite corner. I’ve tried out these tools and foresee many operations where they will prove indispensable. I have found carvers put bevels on their tools as low as 15° and as high as 30°. High bevels are especially useful for hardwoods because they allow for a more durable edge. At the same time, however, more energy is required to work the tool through the wood. 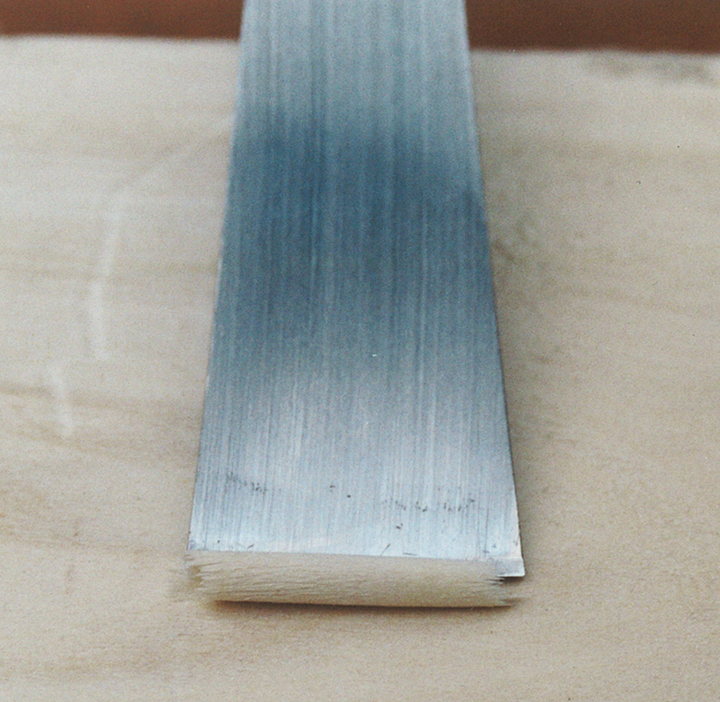 Lower bevels are suitable for softwoods because a durable edge is not as critical and the thinner edge does not require as much effort to push it through the wood. One European-trained carver I interviewed argues that when gouges are used with two hands as opposed to being struck with a mallet, a low cutting angle puts the hand gripping the blade too close to the wood. A steep angle, on the other hand, puts that same hand too far above the surface of the project, and carving becomes tiring. This same carver intentionally puts another bevel on the inside of his gouges, much as Chris Pye’s #2 1/2 finishing gouges offer. Even though the bevel is far slighter than Chris’s—no more than 5°—the tendency for the tool to be pulled into the project is reduced. That inner bevel provides an added margin of control, especially when using the tool in both hands. Still another carver offers an additional reason for a small inside bevel. The second bevel makes the chips curl and split better. There seems to be a hard and fast rule about a bevel that dictates it be flat. In other words, it must be at a constant angle from front to back. A rounded bevel won’t cut properly because it causes the cutting edge to lift prematurely or it increases the angle, which in turn makes it harder to push the cutting edge through the wood. However, some carvers like to round the heel or back of the bevel to make it easier to lever the tool out of the wood. Before a tool comes out of the factory, its cutting edge is ground straight across. But when you grind it, that straight edge often gets inadvertently curved. 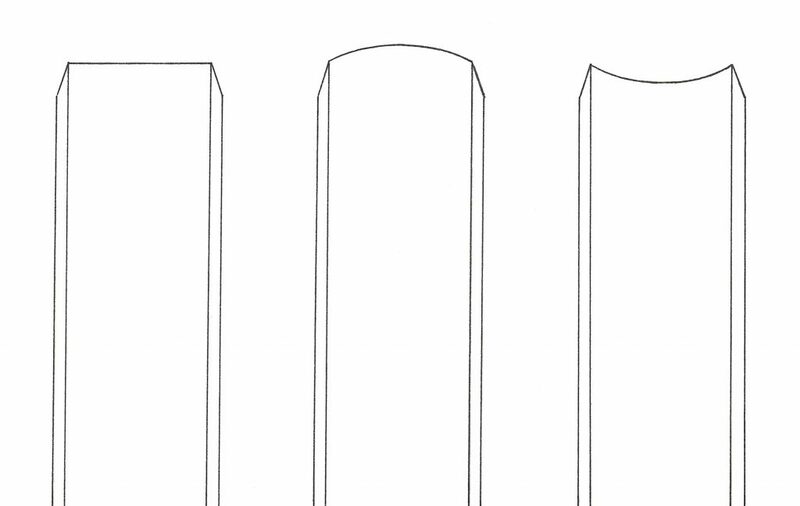 Some carvers argue that a concave hollow cuts poorly because the outside edges are in front, which are impeding the forward thrust of the cutting edge. Others disagree, pointing out that these outside corners clear a path for the middle of the cutting edge. The downside is that you cannot get the tool into a square corner. A convex edge can be desirable because the corners won’t catch and you will actually get a smoother cut than a straight-across blade can offer. Some carvers recommend that the convex curve match the sweep, but others prefer a bull nose or very rounded shape. As an antique junkie who frequents shops and shows selling the old and collectible, I do come across tools that were once held in the hands of master carvers. Two name brands turn up with some regularity. Buck Brothers, an American company that still makes tools, is one of them; Addis is the other. An English firm, Addis dominated the carving tool scene from the middle of the 19th century into the early part of the 20th. Originally two brothers with initials J.B. and S.J. formed a partnership in London. Most of the Addis tools you will find are labeled J.B. Addis & Sons. Although the company has long closed up shop, the tools that remain are still highly regarded by tool collectors and carvers in need of superior tools that offer profiles and sizes that may be unavailable from today’s tool manufacturers. Unfortunately, old tools come with caveats. Tools with straight blades function best when the handle and blade are in perfect alignment. This guarantees that the full force of the thrust is going to the cutting edge. I’ve found old tools with bent tangs. But since most of these old tools were not hardened all the way through, you can straighten them with a few blows of a hammer. Or, a new handle may have to be fitted, and that can take some practice if the starter hole in the handle isn’t perfectly aligned. Sometimes cracks show up on the blade of an antique tool. If you end up buying it, the best place for it is on a wall where other antique tools are displayed. The biggest problem with antique tools is not necessarily how they were cared for but instead how much sharpening they underwent. Cutting tools are typically tempered on their ends. If a significant part of the blade has been ground away and consequently shortened, the tool probably won’t keep its edge. Heat treatment becomes necessary, and most carvers find re-tempering too daunting. Early records seem to confirm that Medieval carvers had as many as 3000 carving tools for dealing with every imaginable cut. I know two contemporary carvers who do ornamental and architectural as well as sculptural work. They own between 200 and 300 tools each. However, the number of tools they use on a regular basis is probably less than two dozen. 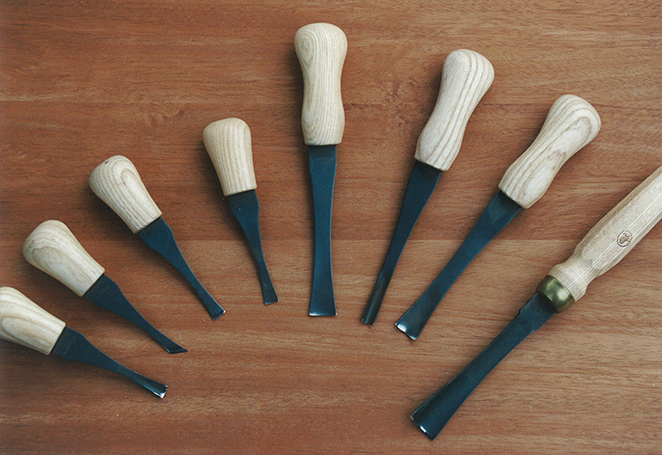 How many standard chisels, gouges, and V-tools do you need to start out? Pfeil® Swiss Made offers over 350 different tools, far in excess of what will get you launched as a woodcarver. While a few will help remove wood, most every conceivable flat and contour, it’s impossible to predict how wide your first tools should be. Size of the project will dictate the scale, but carvings change dimensions on a regular basis. I suggest you look for tools between 1/2″ and 3/4″ (1.3cm and (1.9cm) if your projects are larger than caricature size. Here’s a suggested list for a starter set based on recommendations I gathered in the field: chisel, skew chisel, #3, #5, #8, #11, 60° V-tool. I also advise that you purchase a set of palm tools. Exceptional sets are offered by Cape Forge, Diobsud, Sorby, pfeil®, Ashley Isles, Two Cherries, Flexcut™, Stubai, U.J. Ramelson and others. I’m reluctant to recommend one brand over another. I do suggest that you evaluate the sizes offered. Sets include as few as six tools and as many as 12. If you can build a comfort zone with these sets, then it’s time to branch out and get a feel for additional profiles and shapes. To purchase palm tools and full-size chisels, gouges, and V-tools, check the ads in WCI. Nearly every retailer that handles carving accessories offers the above-mentioned brands and others.